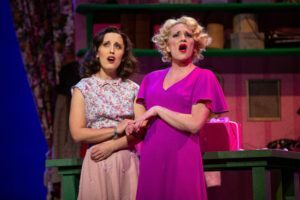 Sarah DeYong and Gracie Anderson in SHE LOVES ME. Photo by Devon Cox. Whenever I attend the Artistry Theater, I’m struck by what a play-going bargain it is. The commodious parking lot is filled with free parking; the lobby is huge; there’s a wonderful and large room filled with pretty-good art. (The rest room is cramped and a little stinky, but you can’t have everything.) The right-sized theater, the Schneider, is perfect for the sweet musicals Artistry does. As to the show under discussion here, She Loves Me (in the Schneider, through Feb 17): the cast list has only two asterisks signifying that the two performers – T. Mychael Rambo and Benjamin Dutcher, both outstanding – are members of Actors Equity. Professionals, IOW. The rest of the cast are amateurs. But does this suggest a compromise in the level of talent Artistry brings to She Loves Me? Heck, no. The leads have wonderful presence, charisma and musical chops in abundance: Sarah DeYong (Amalia), Ryan London Levin (Georg), Gracie Anderson (Ilona), and the previously mentioned Dutcher (Kodaly) carry the show, belt their songs winningly and are altogether a great pleasure to watch. They are supported by a terrific side cast too numerous to mention, though I have to mention the extreme wonderfulness of C. Ryan Shipley (Sipos) and Michael Conroy (Laszlo). Director Benjamin McGovern stages She Loves Me with low-budget intelligence. He and his team of designers — set design is especially notable; credit the terrific Rick Polonek — have created a series of moveable set pieces which unobtrusively moves around the stage, effectively creating Maraczek’s Parfumerie, a street, a restaurant, Amalia’s flat, etc. It really works. The biggest problem with She Loves Me (book by Joe Masteroff; music by Jerry Bock; lyrics by Sheldon Harnick) is something Artistry has no control over: the story – the clerks Amalia and Georg despise each other in the parfumerie, but are head-over-heels in love through an anonymous exchange of love letters – has been done ad nauseum. There is the original straight play (a bizarre term) by Miklos Laszlo (produced at the old Guthrie), James Stewart’s The Shop Around The Corner, Judy Garland’s In The Good Ole Summertime, Tom Hanks’s You’ve Got Mail. It’s a sweet story, though rather shopworn. Ah, but don’t let the familiarity of the story stop you. Artistry is a uniquely approachable and easy-going theater, and their work is excellent. John Olive is a writer living in Minneapolis. His book, Tell Me A Story In The Dark, about the magic of bedtime stories, has been published. John’s The Voice Of The Prairie has been performed 100 plus times and ditto Minnesota Moon and his adaptation of Sideways Stories From Wayside School. His The Summer Moon won a Kennedy Center Award For Drama. John has won fellowships from the Bush Foundation, The McKnight Foundation and from The National Endowment For The Arts. Please visit John’s informational website. John your comments are spot-on but your chronology a little misguided. Of all the stories that have taken this plotline, the original Hungarian straight play was the first. The musical was then an adaptation of this play. All the others you listed then followed. John, one correction, if you would indulge. The other actors in the production are certainly NOT “amateurs”. I know for a fact that they are being paid, which makes them “professionals”, though they are non-union actors. Please understand that becoming an Equity actor means that the actor has been cast in a production at an Equity theater for enough weeks of work to be eligible to join the union, if they so choose. Sometimes that means they have been cast by one director for one show, and sometimes it may take being cast in multiple productions over many years. Being AEA often means better pay, and health benefits for actors who work enough weeks of the year (which all requires being cast by directors, which I hope you agree is a highly subjective matter and not a true measure of skill or education). And of course, some actors decline to join the union, for lots of reasons, which does not make them amateurs, either. Thank you!